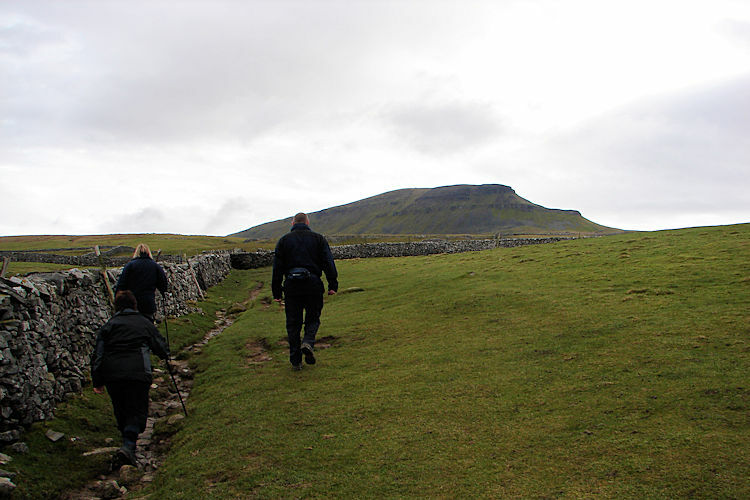 Summary: Setting off from Horton in Ribblesdale and walking via Brackenbottom is viewed as the classic ascent of Pen-y-ghent. Quite rightly too for the walk begins as a gentle climb with the mountain often hidden from view until it appears in view on Brackenbottom Scar. 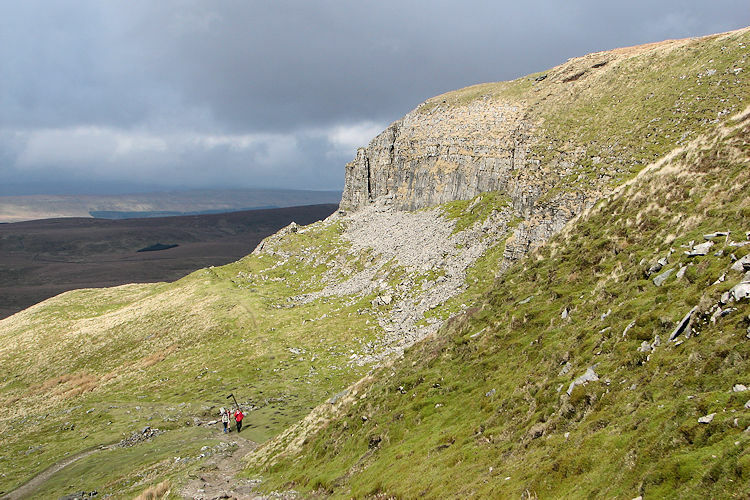 The southern profile of Pen-y-ghent stands awesome and inspirational in view with two distinct short steep climbs becoming increasingly obvious as one draws closer. 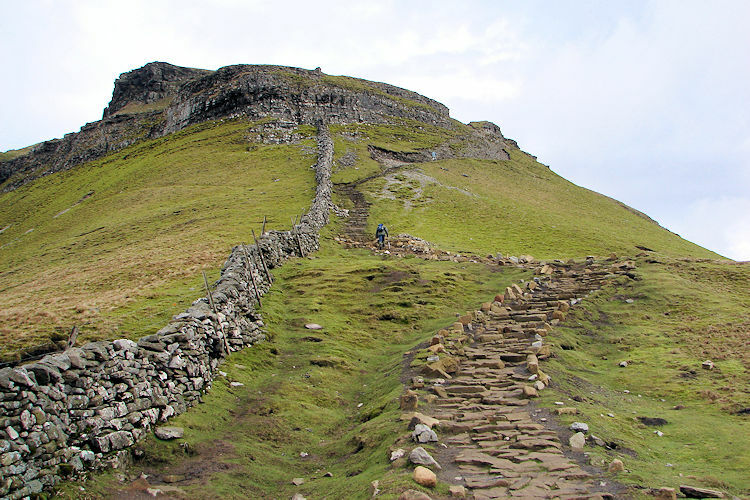 This image is justice enough to be the ultimate Pen-y-ghent route. 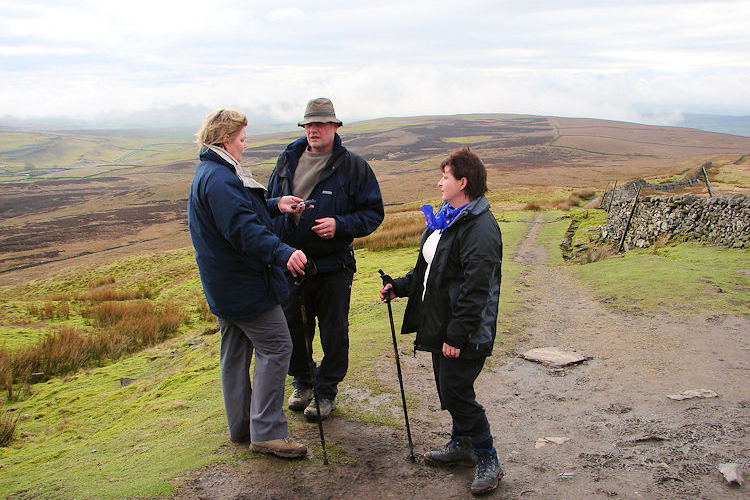 And once on the summit the views are spectacular with Whernside and Ingleborough, the two other mountains which complete the Three Peaks of Yorkshire clearly visible to the north east. 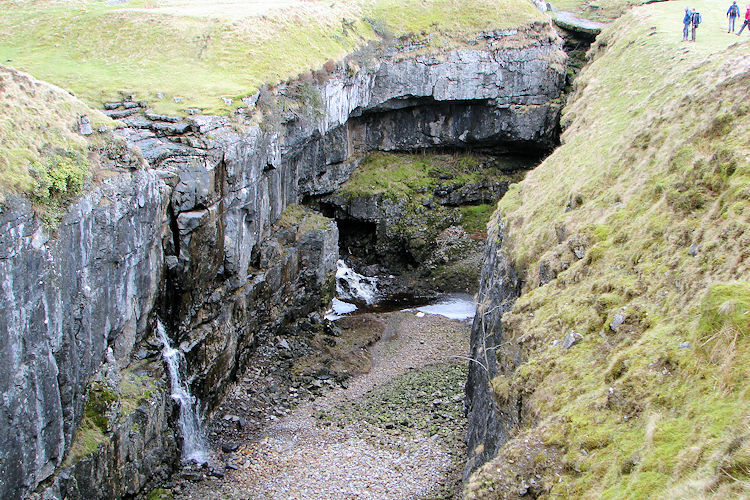 After completing the visit to Pen-y-ghent the walk continues to Hull Pot, the largest natural hole in England. This is a walk with a wow factor. 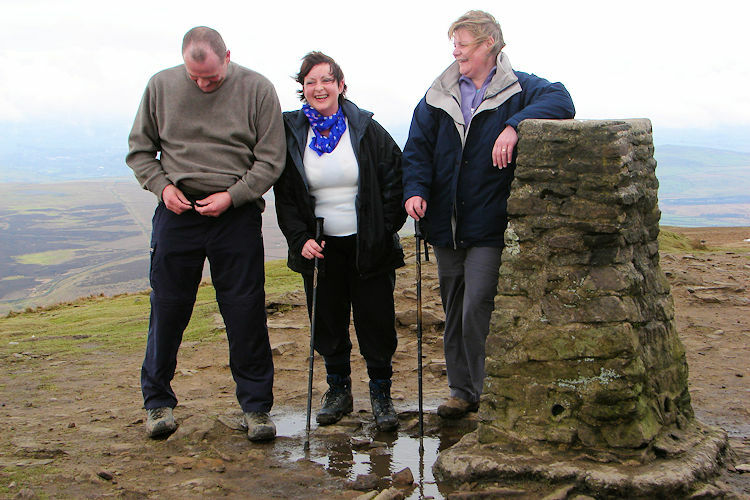 It was the first walk of 2007, in good company and on one of my all time favourite Yorkshire Dales walks to the summit of one of my favourite Yorkshire Dales hills. And on a fine late winters day in what has been a rather wet spell of weather. 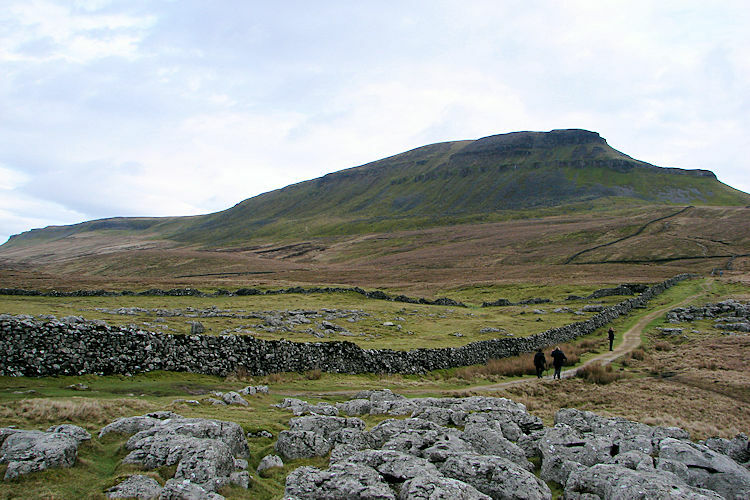 Pen-y-ghent has always been a rather special hill for me, one of the three peaks of the Yorkshire Dales and in my opinion the most attractive. The most shapely of them all, a hill that looks different from whichever angle one views it. From Settle Scar it stands alone and proud. From Halton Gill leonine. 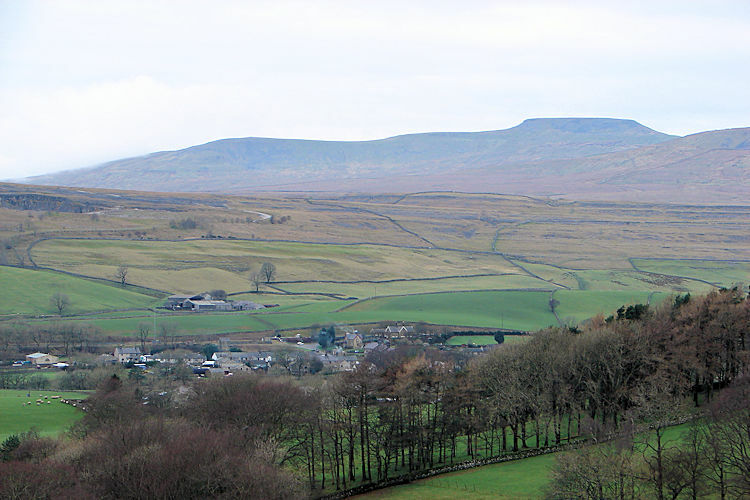 And from Horton in Ribblesdale it rises like a Behemoth, a slumbering monstrous giant. My brother Ray and sister in law Karen were over from Northallerton and so with my wife Lil also doing the walk the four of us set off walking on a day which was overcast but dry. The drive from Harrogate involved a detour for the Highways chaps were working on gullies on Blubberhouses Moor. It was our first detour of the day, unplanned. There would be one more detour to come, this time on the walk and this time planned. More on that later. 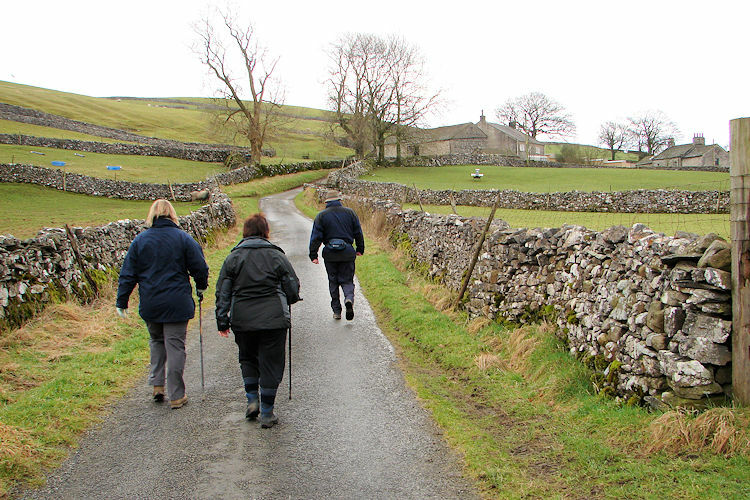 We left Horton by walking along the lane from Horton Bridge past Nether Close to Brackenbottom Farm. From Brackenbottom Farm we followed the footpath by the wall sides while climbing steadily towards Brackenbottom Scar. Sometimes our target was in view, sometimes not but we could always take in the complimentary view to the north east of the remaining three peaks, Ingleborough and Whernside. "Hills for another day" I said to the team. Ray was agreeable, the girls not so sure. 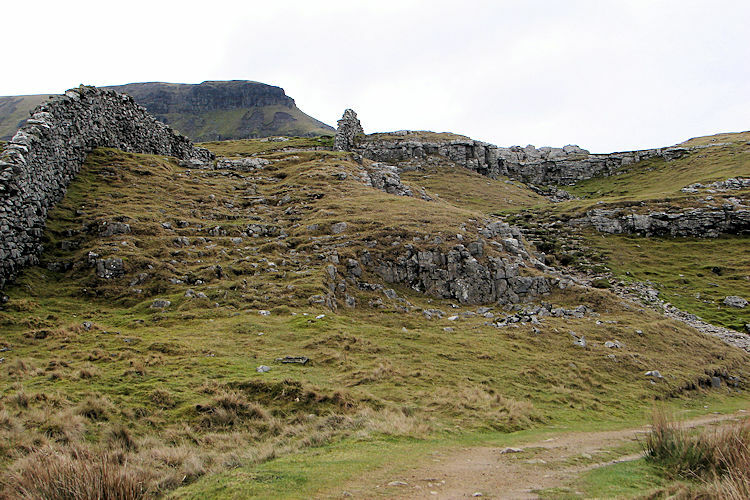 At Brackenbottom Scar the walk took in some easy scrambles up limestone outcrops. It was fun. Fun for all. 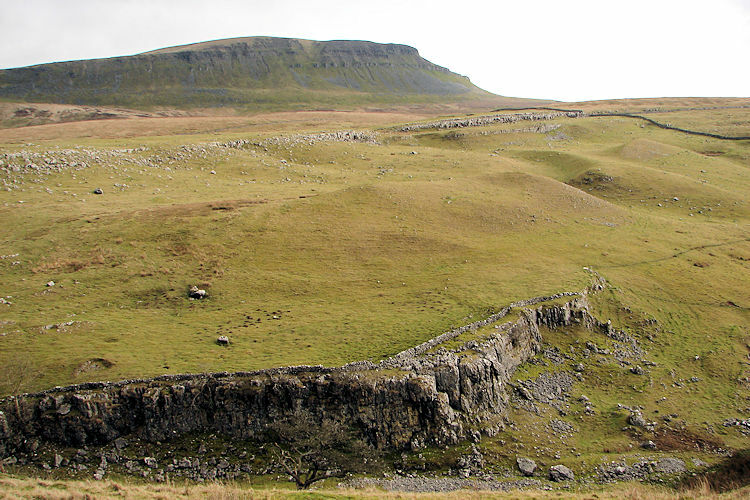 After Brackenbottom Scar the southern face of Pen-y-ghent loomed large and at Gavel Rigg the spectacular face was at its most imposing. It was also clear how the steady climb had now become steep. "Chuffing heck" said Lil amusingly while taking a breather before the steep ascent. There are two sections to the final climb. 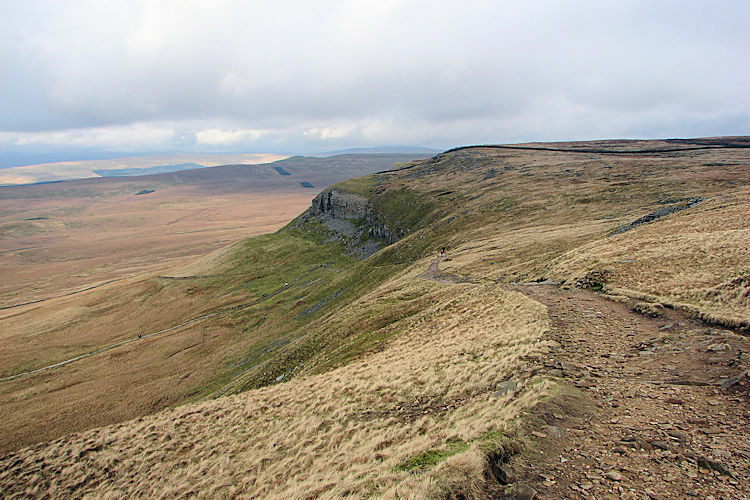 The first is on to Pen-y-ghent's snout and the second onto Pen-y-ghent's brow. The first involves a little easy scrambling and so does the second but it is never difficult. I have always found the wind blowing over the western flank trickiest but this time it was less so. 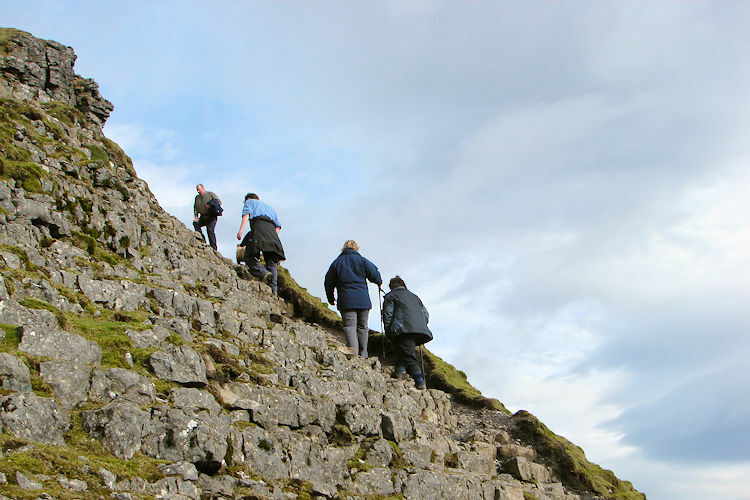 We all climbed up steadily and surely. 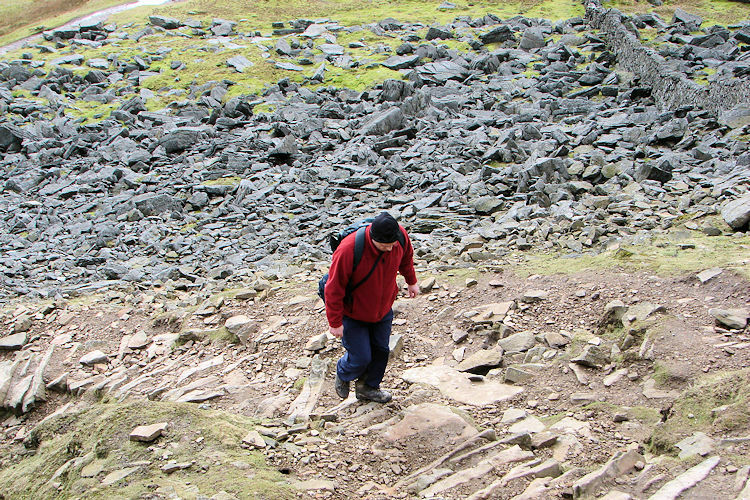 It was as it was on the Brackenbottom scrambles, fun. Ray helped pull Lil and Karen up on a couple of occasions. Soon the climbing was done and we were on the summit plateau. It was much colder up on top. a chill wind was blowing over and once at the trig point we snuggled by the wall and dined on Lil's well prepared delicious sandwiches. A yummy hilltop time. We did not linger on top of the mountain for long once we had finished refreshments. 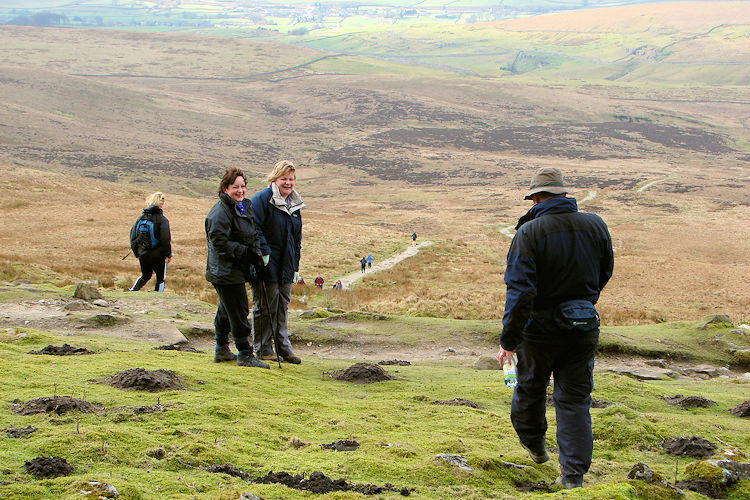 It was blooming cold so with some vivacity we marched down from the top part of Pen-y-ghent and down towards Pen-y-ghent Side and Pen-y-ghent Needle, a small broken limestone edge that stands proud. One day it will fall and on that day it will be sad. But not today. At the point where the path turns from north to east Ray and I lingered for the girls had fallen behind while ambling in chat. In fact they chatted all the way down! It was clear they were having fun on their walk, as Ray and I were which was good. And so to the planned detour. I took my companions to Hull Pot, the single largest hole in England. They had never been to Hull Pot before and I could not let them miss the opportunity. It is superb with two sunken waterfalls within the Pot. Today they were both flowing. That is not always so. I noticed the pot had grown in side for a collapse had happened on the eastern side. Hull Pot is an inspirational place. 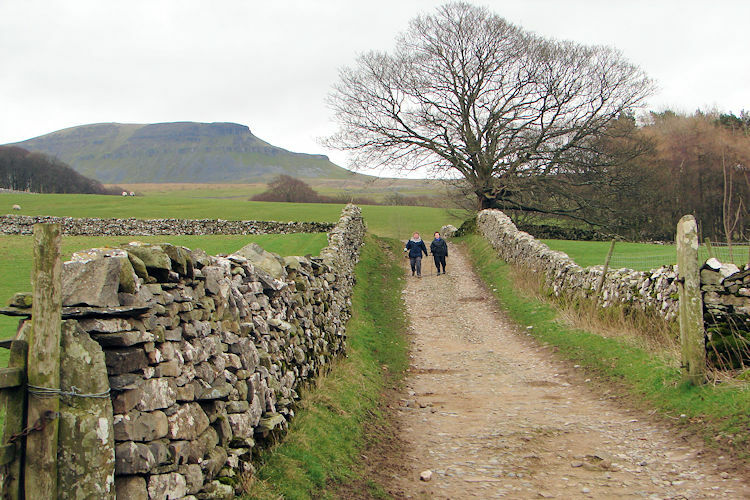 After time spent at Hull Pot we set off back to Horton in Ribblesdale along the bridleway from Hull Pot to Skell Gill Pasture and Horton Scar. I thought of past times. Of good times. I looked to Lil, Karen and Ray and mentioned to them that a few years ago it could well have been Steve, Dave and Deke in their place. Steve is now too far away, Dave cannot walk far and Deke, this walk was for you my greatly missed friend. The three new walkers will take your places in keeping me company on walks but I will keep my memories of walks with you safe. It was good for Lil to have Karen as company. And for me it was good to have Ray. The girls managed a mutual pace as did we. In all it made a good walk great fun.